In this post, I have written about a Vashikaran Mantra that is dedicated to Baglamukhi Devi, which is said to give the practitioner the power and ability to attract the inhabitants of all the three worlds. In the Hindi language, this Vashikaran Mantra is called as the Dev, Prithvi Aur Patal Ke Logon Ko Vash Karne Ka Mantra. This means that this Vashikaran Mantra Chant can generate such tremendous force, vibrations and energy that every being in the cosmos, including the dwellers of Heaven, Earth and the Under or Neither-world will come under the most powerful and effective Occult Attraction Spell of the practitioner. The Vidhi of gaining Siddhi over this Vashikaran Mantra is uncomplicated, the Vashikaran Mantra given below has to be chanted 12, 500 times daily for a total of 21 consecutive days. The Mantra Sadhana has to be started during the specific period of the Pushya Nakshatra. 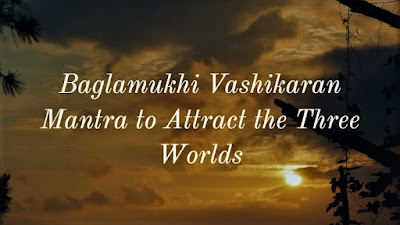 Note- Only 3 basic guidelines for practicing this most powerful Vashikaran Mantra Sadhana have been given in this post because this Vashikaran Mantra names Baglamukhi Devi who is among the Dus Mahavidya Tantric Goddesses. Hence, the practitioner has to be extremely well versed in worshiping Dus Mahavidya Goddesses and familiar with all the Vidhis, rituals and procedures if he attempts this Vashikaran Mantra Sadhana. There are two exclamation marks in the composition of this Vashikaran Mantra because there has to be extreme intensity while chanting the Mantra. If any reader wishes to practice this Baglamukhi Vashikaran Mantra Sadhana to attract all beings, then he should do so under the guidance of advanced Sadhak who has actual experience of practicing Dus Mahavidya Sadhanas. 125000 times on each day or for 21 days total? 12, 500 times each day for all the 21 days. माँ बगलामुखी को 'नित्ये 'कहकर सम्बोधित किया गया है .वे नित्या हैं ,नियमेन भवः -जो सब दिन रहे ,जिसका कभी नाश न हो ,शाश्वत ,अविनाशी .उत्पत्ति -विनाश -रहित .दूसरा सम्बोधन 'विन्ने' है .विन्न =विचारित ,जाना हुआ ,प्रसिद्ध,उपलब्ध ,स्थापित . बगलामुखी साधना के लिए स्थान की शुद्धता का ध्यान रहे . वस्त्रों के चुनाव में पीले रंग का ध्यान रखें . फूल भी पीले रंग के ही होने चाहिए . जप के लिए माला हल्दी की गांठ की बनी हुई लें . आसन भी पीले रंग का ही लें . सबसे पहले किसी चौकी पर पीले रंग का कपड़ा बिछा कर उस पर हल्दी से रंगे पीले चावलों से अष्टदल का कमल बनाएं . यह करने के बाद इसपर मां बगलामुखी की तस्वीर अथवा यंत्र को स्थापित करें .यथाविधि पूजन के बाद जप प्राम्भ करें .